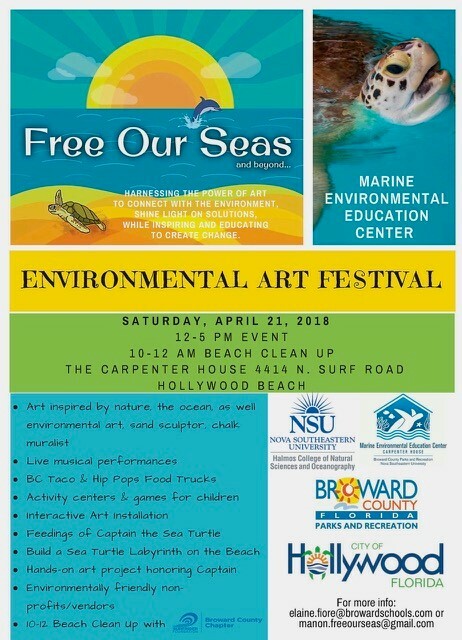 In celebration of Earth Day, Free Our Seas and Beyond is partnering with Broward County, NSU, the Marine Environmental Education Center (MEEC) at the historic Carpenter House and the City of Hollywood to host the inaugural “Free Our Seas and Beyond Environmental Art Festival” on Saturday April 21st at 4414 N. Surf Rd. The Festival kicks off at 10:00 am with a community beach clean-up sponsored by the Surfrider Foundation of Broward County and from noon to 5 pm original art work inspired by nature and up-cycled and recycled environmentally themed pieces will be on display. The day’s festivities also include live musical performances, food trucks, children activities, environmentally friendly vendors and non-profit informational tables. You can also meet Captain the rescued sea turtle who is a permanent resident at the Carpenter House. In honor of Mother Earth the festival is a PLASTIC FREE ZONE, cold filtered water will be available, please bring your reusable bottle. If you forget to bring one, we will have them available for purchase at the Free Our Seas informational table. Please consider walking, biking (Bike Valet will be provided), or carpooling to the festival.